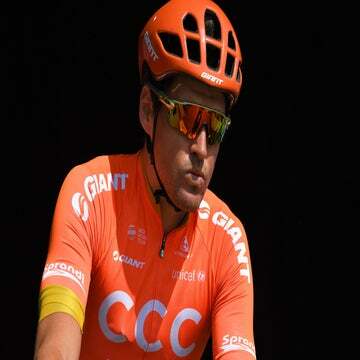 AREZZO, Italy (VN) — Greg Van Avermaet timed it right Friday at Tirreno-Adriatico. With the classics approaching and a doping hearing going on at home in Brussels, the Belgian stormed over the cobblestones leading up to Arezzo’s city center to win ahead of several classics champions. “It’s important to be a leader of the team, but you are only a leader if you win races,” BMC Racing’s Van Avermaet said. Van Avermaet changed his red and black BMC jersey for a blue one after the stage. Finishing ahead of Peter Sagan (Tinkoff-Saxo), Zdenek Stybar (Etixx-Quick Step), Filippo Pozzato (Lampre-Merida), and Fabian Cancellara (Trek Factory Racing), he gained enough time to take the overall lead. The jersey came at the expense of the yellow Tinkoff-Saxo train, which pulled most of the day in the hopes of delivering Sagan to his first win in more than six months. Sagan clearly looked unhappy at the finish after being shut down once more, this time by Van Avermaet. Van Avermaet had his team working for him, too, but the BMC cyclists took a more ninja-like approach, coming out to strike against their rival teams only when it was necessary. The efforts of Brent Bookwalter, Daniel Oss, and Damiano Caruso stood out in particular. The joke at the finish line before the conclusion of the stage was that Van Avermaet would finish second or third. Given his recent results, followers thought such a finish was fitting for him. This year, he placed second in Strade Bianche and sixth in Omloop Het Nieuwsblad, and in 2014, second in the Ronde van Vlaanderen and second in the Tour de France stage to Sheffield behind Vincenzo Nibali. After such a win ahead of such company, BMC Racing will certainly lean on Van Avermaet more in the upcoming classics and monuments. This will especially be the case with American Taylor Phinney still recovering from surgeries, and not likely to begin his season until late into 2015. Van Avermaet should be one of the leaders in Milano-Sanremo, E3 Harelbeke, Gent-Wevelgem, the Ronde van Vlaanderen, Paris-Roubaix, and the Amstel Gold Race. BMC will also be counting on Philippe Gilbert and Marcus Burghardt. The outcome of a doping case brewing in Brussels will come later. Today, Van Avermaet’s lawyer met with the Belgian Federation lawyers and agreed to push off the hearing until April 16, three days before Paris-Roubaix. The details are not clear, and the 29-year-old did not expand on them, but it is believed to be based on whether or not he injected Vaminolact, a drug for premature babies. If he injected it, it could be a anti-doping violation, otherwise it could not since the drug is not on WADA’s banned list. The case centers on Doctor Chris Mertens and five athletes, one footballer and four cyclists, including the winner of today’s Tirreno-Adriatico stage in Arezzo.